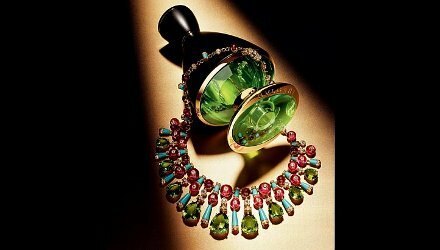 Bvlgari will launch Le Gemme, a new collection of luxury perfumes inspired by semi-precious stones and their historical trade routes, in September. The six fragrances include Lilaia (peridot; shown), Ashlemah (amethyst), Amarena (tourmaline), Noorah (turquoise), Maravilla (citrine), and Calaluna (moonstone). All six were developed by perfumer Daniela Andrier. I will update with individual descriptions when I can. The Bvlgari Le Gemme fragrances are packaged in bottles inspired by roman urns, and will run approximately $499 (SGD, about $399 converted to USD) for 100 ml Eau de Parfum. Update: The Bvlgari Le Gemme fragrances will also be in 30 and 350 ml. They will not launch in the US until early 2015. Amarena ~ tourmaline, a fruity floral with tuberose and powdery rose. Ashlemah ~ amethyst, with lavender, iris, violet and heliotrope. Calaluna ~ moonstone, with sandalwood, cardamom, heliotrope, ambrette and pear. Lilaia ~ peridot, a fresh woody fragrance with mastic, peppermint, orange and mate. Maravilla ~ citrine, a chypre with citrus, as well as peach, jasmine and patchouli. Noorah ~ turquoise, with galbanum, cardamom, iris, benzoin, tobacco, oak, patchouli and vanilla. That’s a gorgeous bottle, but unless it comes with the necklace, that price is ridiculous. Hard to say what the US price will be, if they even launch here, but looks like they are going after the very rich…they’re also starting to do bespoke. The rich ‘win’ again, darn it. Would love to get my hands on a bottle of these. Ouch, so pricey. But since Daniela Andrier is one of my favorite perfumers I will definitely want to at least sample them. Never say never, I guess, but I bet I will give these a skip. Oh good heavens! That photo demonstrates that being expensive and being tacky are not mutually exclusive! They are pandering to the very newly rich here, it seems. And no, there is no undertone of envy in my post here, none at all! Lol. But if I had the money to buy that, I think I would find something prettier to buy instead. I don’t ask for much, sharing is caring, lol:). I think it’s laying on its side. Probably looks better upright…drool. But looks top heavy..klutzy me would knock that over for sure..then drooling would turn to crying, lol. They look a lot less enticing in that photo. Drooling over. Oy! Too rich for my blood. I saw a photo of the bottle in profile and it looks gorgeous (though a little unstable). So pretty! But yes, unless they spin around like tops and emerge unscathed when tipped over, even if I won the lottery, no. These are on sale at Harrods as of last week if anyone is in london and depserate to try them. I tried a couple – they were nice but they didnt blow me away – especially at that price !